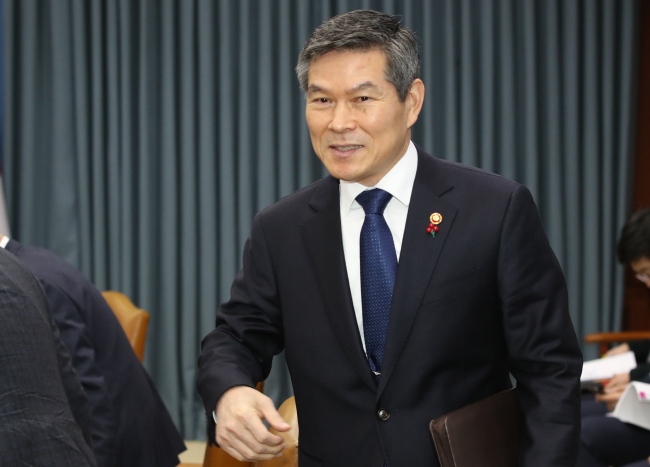 Defense Minister Jeong Kyeong-doo reiterated Tuesday that the transfer of wartime operational control would not lead to the withdrawal of the US forces stationed in the country, or the dissolution of the ROK-US Combined Forces Command. Responding to a question during a local TV show, Jeong reiterated that the planned transfer of OPCON would not affect the allies’ current combined defense posture, over which conservatives here have often raised concern. “I can clearly tell you that even if the wartime OPCON transfer (to Korea) takes place, the US forces here will not be pulled out, nor is the CFC going to be dissolved,” he said on a special New Year’s program aired on KBS. In October, the defense chiefs of South Korea and the United States signed strategic guidelines titled “Alliance Guiding Principles,” which include a set of commitments to maintain US troops in Korea as well as retain the CFC and the UN Command. Jeong, however, explained they have not yet set a specific date for the transfer of operational control, when asked about the possibility of it happening by 2022. South Korea handed operational control of its military to the commander of the US-led UN Command during the 1950-53 Korean War, and it was transferred to the chief of the CFC in 1978. Talks on transferring wartime OPCON back to Seoul were initiated but have been delayed for over a decade due to Pyongyang’s provocations. During the talk show, a civilian panel asked about the country’s policy directions in 2019 and Jeong spoke about the country’s conscripted military service. Asked whether the Defense Ministry would consider a volunteer military system if the two Koreas declare the end of the war, Jeong said it is too early to review the option. “The discussion on implementing a volunteer military service should not only be a military agenda (item), but (should be discussed) at a national level,” Jeong said.